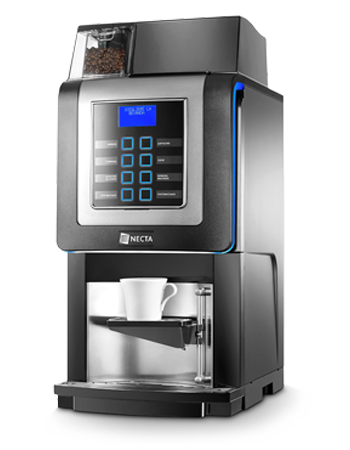 Korinto is a cost effective and easy to use bean to cup coffee machine that is ideal for a variety of locations including the office, meeting room, small cafe or even bar. The machine uses a granulated milk (we highly recommend Milfresh for the best result) to create the milk based coffees such as cappuccino and latte which makes it much easier to clean and maintain than systems that use fresh milk. The Korinto also gives you the option of hot chocolate and mocha created from Suchard or Cadbury chocolate powder. Another useful feature is the adjustable cup stand which allows the use of a variety of different sized cups, mugs and glasses. The Korinto is available with a coin pod that allows you to charge for drinks as well as base cabinets for extra storage and a cup warmer for the warming of china cups and mugs before use. The Korinto requires plumbing into the mains water supply which allows the fitting of a commercial water filter in order to improve the quality of the drink and reduce issues that can occur because of lime-scale build up. It is important to fit a filter as limescale build up is a particular problem in London and the South East of England and is the single biggest cause of breakdowns in coffee equipment. The Korinto features an automatic cleaning cycle that is activated with the touch of a button and doesn’t require any specialist cleaning products. This makes it much easier to live with on a day to day basis than a system that uses fresh milk, and makes it much more suitable for situations (such as an office) where there aren’t any full time catering staff on hand to look after the machine. The Korinto does offer a hot water option for tea, however it should be stressed that it is not designed to produce large quantities of water (as this will impair the performance of the system). It is a good idea to install a separate hot water boiler if you require lots of water for tea. The Korinto is a very good choice if you are looking for a bean to cup coffee machine that is cost effective, produces a great drink but doesn’t require a lot of daily maintenance. These factors combined have made it the most popular bean to cup system that we supply in London and Buckinghamshire, Berkshire and Hertforshire. The Korinto has proved to be a great success in many locations such as offices, meeting rooms, reception areas, hotels and cafes. Our in-house team of technicians are on hand to solve any problems that you may have with your Korinto bean to cup coffee machine, or any of our other other rental or Lease coffee machines.